The Anti 9-to-5 Guide » Q&A: How’d you score THAT gig? Q&A: How’d you score THAT gig? 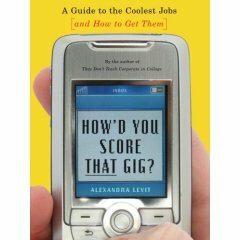 If you or someone you know is graduating this year or thinking about changing careers, check out Alexandra Levit‘s brand-spanking-new book, How’d You Score That Gig? A Guide to the Coolest Jobs — and How to Get Them. Reading this book is like going on 60 informational interviews for some of the most coveted careers out there — boutique owner, inventor, video game designer, archaelogist, landscape architect, futurist, classic-car restorer, and on and on and on. Happily for us, Alexandra answered a few of my questions about writing this book and some of its most important take-aways. Q. What prompted you to write this book? A. The idea originated as a result of several conversations I overheard at friends’ dinner parties. It seemed that someone at every event always had a job that totally intrigued the rest of the group. People were completely captivated by this individual, and were always curious to know how s/he scored the gig, and what exactly it entailed. Q. In doing your research for all these careers, what did you unearth that surprised you most? A. First of all, because I tend to caution people against going to graduate school to prepare for a career they have no experience in and don’t know if they even like, I was encouraged to discover that so many of the dream jobs didn’t require a master’s degree for entry into the field. Second, it was interesting to find that so many of the jobs I was profiling attracted similar types of people. For example, documentary photographers, travel journalists, news correspondents, and oceanographers are all rather spontaneous and thrive on new and varied experiences. This led me to develop my seven “passion profiles” — adventurer, creator, data-head, entrepreneur, investigator, networker, and nurturer — and place my 60 cool jobs into the appropriate categories. Readers can take a quiz at the beginning of the book to see what passion profile and corresponding jobs best suit them. Q. Was there one refrain you kept hearing over and over in the interviews you did with these dream careerists? A. It’s not about talent, it’s about persistence. Most of these careers are tough to penetrate, but not impossible. If you take the right steps and push hard enough, for long enough, you will eventually break through the wall. Q. Were there any dream careers you once mythologized that now have you thinking, “Ugh, I could never ever do that!”? Any that you’d initially looked down on that now have you raising an eyebrow? A. I used to think that it would be amazing to own my own business, but after speaking with dozens of entrepreneurs, I’ve realized that it’s incredibly hard work. You have to sacrifice your personal life for a long time to get things off the ground, and frankly, I don’t know if I have what it takes. I didn’t exactly look down on any of the top careers per se, but I was pretty surprised when school teacher ranked so highly in the survey. I wouldn’t have personally considered this a dream job, but the teachers I interviewed were some of the happiest, most satisfied people in the entire book. Q. What are the top three things a newbie with no experience in their dream field can do to break in (aside from applying to grad school)? Join an appropriate professional organization and attend events regularly. Research individuals doing your dream job, and set up informational interviews with them. Q. Give us your best informational interviewing tips. A. Use the Net, your contacts, and your college’s career center to set up informational interviews with people already working in your career of choice so that you can learn more about what the job actually encompasses. In these meetings, which will usually take place via the phone, don’t be afraid to ask specific questions about training requirements, responsibilities, salary, work environment, and opportunities for advancement. As long as you are polite, no one will fault you for wanting the real scoop, and if a job is not as glamorous as it sounds, you want to know that before investing your time and energy. Q. How do you account for a complete career 180 in a resume and cover letter, say if you’re applying for an internship or entry-level gig in a field you have zero experience in? What do you say (especially if you’re in your mid-thirties and above)? A. Instead of writing a resume that lists your previous and unrelated jobs, which might have your potential new employer questioning the relevance, create a functional one that’s organized by transferable skills that would be applicable in your new career, such as client relations, project management, and budgeting. This will turn their attention to what you know already as opposed to what you might be missing because you haven’t worked in the field before. Q. So many people choose miserable complacency in a career they loathe because they’re worried about the financial ramifications of starting at the bottom again. Or they’re scared of change. What advice can you give to light a fire under their butts? A. First, ease into a new career one foot at a time. Perhaps this means earning a paycheck at your current job while doing a part-time internship in your new field or taking an adult education class or workshop on the weekend. The only way to find out if you’re passionate about something is to try it, and to do so risk-free will make it less daunting. Also, remember that any progress is good progress. As you say, even confident people stay in unsatisfying jobs because they feel safe, and because they’re afraid of making a bad decision. But in the quest to uncover a source of meaningful work, your worst enemy is inertia. Q. Were there any careers you’d initially planned to put in the book that landed on the cutting room floor? Why? A. There was only one — astronaut. This career made the Top 50, but I couldn’t include it because NASA refused to grant me an interview. I pursued their PR department for weeks to no avail. I feel they missed a terrific opportunity to promote their field to the public. I’m a firm believer in having the coolest job possible. However, I spent most of my thirties hoping to find “the right” job or career only to have come to the conclusion at 40 that there is no One. I was asking the wrong question all the time. Right now, I manage a pet acupuncture clinic, do corporate writing on energy efficiency for very large companies and consulting firms, review movies, and coach on life/work and lifestyle issues. Who the heck knew I would ever be “a utilities expert” — and I wouldn’t want to be that alone. I’m a true anti 9-to-5er — the best scenario for me is just doing a variety of projects all part-time and temporary. This comment is for Barbara Saunders, could you direct someone on how to review movies, and how to learn to coach on life/work issues? I like yourself, like having multiple part time projects to sustain myself, but how did you put it all together?